Definition at line 2330 of file commctrl.h. Definition at line 2338 of file commctrl.h. Referenced by CreateFilterList(), debuglvitem_t(), BtrfsVolPropSheet::DeviceDlgProc(), fill_index_tree(), fill_search_tree(), GetGWListEntry(), GetIPListEntry(), GetListViewItem(), LISTVIEW_CalculateItemWidth(), LISTVIEW_DrawItem(), LISTVIEW_EditLabelT(), LISTVIEW_EndEditLabelT(), LISTVIEW_FindItemW(), LISTVIEW_GetItemBox(), LISTVIEW_GetItemExtT(), LISTVIEW_GetItemRect(), LISTVIEW_GetItemT(), LISTVIEW_HitTest(), LISTVIEW_SetColumnWidth(), LISTVIEW_SetItemTextT(), msi_dialog_vcl_add_drives(), CDefView::OnNotify(), OnTopicChange(), and test_wm_notify(). Definition at line 2343 of file commctrl.h. Definition at line 2342 of file commctrl.h. Definition at line 2339 of file commctrl.h. Referenced by add_zone_to_listview(), CAppsListView::AddItem(), Control_WndProc_Create(), debuglvitem_t(), EnumEventsThread(), FileTypesDlg_InsertToLV(), LISTVIEW_GetItemMetrics(), LISTVIEW_GetItemT(), CDefView::LV_AddItem(), CDefView::LV_ProdItem(), CDefView::LV_RenameItem(), CDefView::OnNotify(), PROGRAM_AddProgram(), set_main_item(), and set_sub_item(). Definition at line 2341 of file commctrl.h. Referenced by debuglvitem_t(), fill_index_tree(), LISTVIEW_GetItemMetrics(), LISTVIEW_GetItemT(), and set_main_item(). Definition at line 2333 of file commctrl.h. Referenced by add_zone_to_listview(), AddIPAddressToListView(), CDowloadingAppsListView::AddItem(), CAppsListView::AddItem(), AddItemToListView(), Child_WndProc(), Control_GetCPlItem_From_ListView(), Control_WndProc_Create(), CreateFilterList(), customdraw_fill(), debuglvitem_t(), DeleteItemFromList(), BtrfsVolPropSheet::DeviceDlgProc(), DirectInputEnumDevCb(), DisplayEvent(), DisplayEventData(), EnumerateServiceProviders(), EnumEventsThread(), FileTypesDlg_DoList(), FileTypesDlg_InsertToLV(), fill_index_tree(), fill_search_tree(), FreeDriveItemContext(), GetDefaultItem(), GetGWListEntry(), GetIPListEntry(), CListView::GetItemData(), GetListViewItem(), CAppsListView::GetLParam(), GetSelectedItem(), GetValueName(), GROUP_GroupWndProc(), InitFilterListBox(), InitializeRecycleBinDlg(), InsertIpAddressToListView(), InsertItemToListView(), IsDefaultValue(), CNetConnectionPropertyUi::LANPropertiesUIDlg(), LANStatusUiDetailsDlg(), LISTVIEW_CalculateItemWidth(), LISTVIEW_DrawItem(), LISTVIEW_EditLabelT(), LISTVIEW_EndEditLabelT(), LISTVIEW_FindItemW(), LISTVIEW_GetItemAtPt(), LISTVIEW_GetItemBox(), LISTVIEW_GetItemExtT(), LISTVIEW_GetItemRect(), LISTVIEW_GetItemState(), LISTVIEW_GetItemT(), LISTVIEW_GetItemTextT(), LISTVIEW_HitTest(), LISTVIEW_InsertItemT(), LISTVIEW_SetColumnWidth(), LISTVIEW_SetItemState(), LISTVIEW_SetItemT(), LISTVIEW_SetItemTextT(), CDefView::LV_AddItem(), CDefView::LV_ProdItem(), CDefView::LV_RenameItem(), lv_set_action(), msi_dialog_vcl_add_drives(), CDefView::OnNotify(), OnTopicChange(), PopupChild_WndProc(), PROGRAM_AddProgram(), RecycleBinDlg(), RefreshDevicesList(), BtrfsVolPropSheet::RefreshDevList(), RefreshServiceList(), set_main_item(), set_sub_item(), CNetConnectionPropertyUi::ShowNetworkComponentProperties(), StoreDriveSettings(), TcpipAdvancedIpDlg(), TcpipFilterPortDlg(), and UninstallApplication(). Definition at line 2334 of file commctrl.h. Referenced by add_zone_to_listview(), AddIPAddressToListView(), Control_WndProc_Create(), customdraw_fill(), debuglvitem_t(), BtrfsVolPropSheet::DeviceDlgProc(), DirectInputEnumDevCb(), DisplayEvent(), DisplayEventData(), EnumerateServiceProviders(), EnumEventsThread(), FileTypesDlg_InsertToLV(), GetListViewItem(), GetValueName(), InitializeRecycleBinDlg(), InsertIpAddressToListView(), LANStatusUiDetailsDlg(), LISTVIEW_CalculateItemWidth(), LISTVIEW_DrawItem(), LISTVIEW_EditLabelT(), LISTVIEW_EndEditLabelT(), LISTVIEW_FindItemW(), LISTVIEW_GetItemAtPt(), LISTVIEW_GetItemBox(), LISTVIEW_GetItemMetrics(), LISTVIEW_GetItemRect(), LISTVIEW_GetItemState(), LISTVIEW_GetItemT(), LISTVIEW_HitTest(), LISTVIEW_InsertItemT(), LISTVIEW_SetColumnWidth(), LISTVIEW_SetItemState(), LISTVIEW_SetItemT(), LISTVIEW_SetItemTextT(), CDefView::LV_AddItem(), CDefView::LV_ProdItem(), CDefView::LV_RenameItem(), lv_set_action(), msi_dialog_vcl_add_drives(), CDefView::OnNotify(), PROGRAM_ModifyProgram(), set_main_item(), set_sub_item(), and TcpipAdvancedIpDlg(). Definition at line 2340 of file commctrl.h. Referenced by add_zone_to_listview(), CAppsListView::AddItem(), AddItemToListView(), Control_WndProc_Create(), customdraw_fill(), debuglvitem_t(), DisplayEvent(), DisplayEventData(), EnumEventsThread(), FileTypesDlg_DoList(), FileTypesDlg_InsertToLV(), fill_index_tree(), fill_search_tree(), CListView::GetItemData(), CAppsListView::GetLParam(), GetValueName(), IsDefaultValue(), LISTVIEW_DrawItem(), LISTVIEW_FindItemW(), LISTVIEW_GetItemT(), CDefView::LV_AddItem(), CDefView::LV_RenameItem(), lv_set_action(), CDefView::OnNotify(), OnTopicChange(), PROGRAM_AddProgram(), RecycleBinDlg(), BtrfsVolPropSheet::RefreshDevList(), RefreshServiceList(), set_main_item(), CNetConnectionPropertyUi::ShowNetworkComponentProperties(), and UninstallApplication(). Definition at line 2332 of file commctrl.h. Referenced by add_zone_to_listview(), AddIPAddressToListView(), CDowloadingAppsListView::AddItem(), CAppsListView::AddItem(), AddItemToListView(), Child_WndProc(), Control_GetCPlItem_From_ListView(), Control_WndProc_Create(), CreateFilterList(), debuglvitem_t(), BtrfsVolPropSheet::DeviceDlgProc(), DirectInputEnumDevCb(), DisplayEvent(), DisplayEventData(), EnumerateServiceProviders(), EnumEventsThread(), FileTypesDlg_DoList(), FileTypesDlg_InsertToLV(), fill_index_tree(), fill_search_tree(), FreeDriveItemContext(), GetDefaultItem(), GetGWListEntry(), GetIPListEntry(), CListView::GetItemData(), GetListViewItem(), CAppsListView::GetLParam(), GetSelectedItem(), GetValueName(), GROUP_GroupWndProc(), InitFilterListBox(), CNetConnectionPropertyUi::InitializeLANPropertiesUIDlg(), InitializeRecycleBinDlg(), InitializeTcpipAdvancedIpDlg(), InsertIpAddressToListView(), InsertItemToListView(), is_assignable_item(), IsDefaultValue(), CNetConnectionPropertyUi::LANPropertiesUIDlg(), LANStatusUiDetailsDlg(), LISTVIEW_CalculateItemWidth(), LISTVIEW_DrawItem(), LISTVIEW_EditLabelT(), LISTVIEW_EndEditLabelT(), LISTVIEW_FindItemW(), LISTVIEW_GetItemAtPt(), LISTVIEW_GetItemBox(), LISTVIEW_GetItemExtT(), LISTVIEW_GetItemMetrics(), LISTVIEW_GetItemRect(), LISTVIEW_GetItemState(), LISTVIEW_GetItemT(), LISTVIEW_GetItemTextT(), LISTVIEW_HitTest(), LISTVIEW_InsertItemT(), LISTVIEW_SetColumnWidth(), LISTVIEW_SetItemState(), LISTVIEW_SetItemT(), LISTVIEW_SetItemTextT(), CDefView::LV_AddItem(), CDefView::LV_ProdItem(), CDefView::LV_RenameItem(), lv_set_action(), msi_dialog_vcl_add_drives(), CDefView::OnNotify(), OnTopicChange(), PopupChild_WndProc(), PROGRAM_AddProgram(), PROGRAM_ModifyProgram(), RecycleBinDlg(), RefreshDevicesList(), BtrfsVolPropSheet::RefreshDevList(), RefreshServiceList(), set_main_item(), set_sub_item(), CNetConnectionPropertyUi::ShowNetworkComponentProperties(), StoreDriveSettings(), TcpipAdvancedIpDlg(), TcpipFilterPortDlg(), test_wm_notify(), and UninstallApplication(). Definition at line 2337 of file commctrl.h. Referenced by add_zone_to_listview(), AddIPAddressToListView(), CDowloadingAppsListView::AddItem(), CAppsListView::AddItem(), AddItemToListView(), Control_WndProc_Create(), CreateFilterList(), debuglvitem_t(), BtrfsVolPropSheet::DeviceDlgProc(), DirectInputEnumDevCb(), EnumerateServiceProviders(), EnumEventsThread(), FileTypesDlg_InsertToLV(), fill_index_tree(), fill_search_tree(), GetGWListEntry(), GetIPListEntry(), GetListViewItem(), InitFilterListBox(), InitializeRecycleBinDlg(), InitializeTcpipAdvancedIpDlg(), InsertIpAddressToListView(), InsertItemToListView(), is_assignable_item(), LANStatusUiDetailsDlg(), LISTVIEW_CalculateItemWidth(), LISTVIEW_DrawItem(), LISTVIEW_EditLabelT(), LISTVIEW_EndEditLabelT(), LISTVIEW_FindItemW(), LISTVIEW_GetItemBox(), LISTVIEW_GetItemExtT(), LISTVIEW_GetItemMetrics(), LISTVIEW_GetItemRect(), LISTVIEW_GetItemT(), LISTVIEW_GetItemTextT(), LISTVIEW_HitTest(), LISTVIEW_InsertItemT(), LISTVIEW_SetColumnWidth(), LISTVIEW_SetItemT(), LISTVIEW_SetItemTextT(), CDefView::LV_AddItem(), msi_dialog_vcl_add_drives(), CDefView::OnNotify(), OnTopicChange(), PROGRAM_AddProgram(), PROGRAM_ModifyProgram(), RefreshDevicesList(), BtrfsVolPropSheet::RefreshDevList(), RefreshServiceList(), set_main_item(), set_sub_item(), TcpipAdvancedIpDlg(), TcpipFilterPortDlg(), and test_wm_notify(). Definition at line 2344 of file commctrl.h. Definition at line 2335 of file commctrl.h. 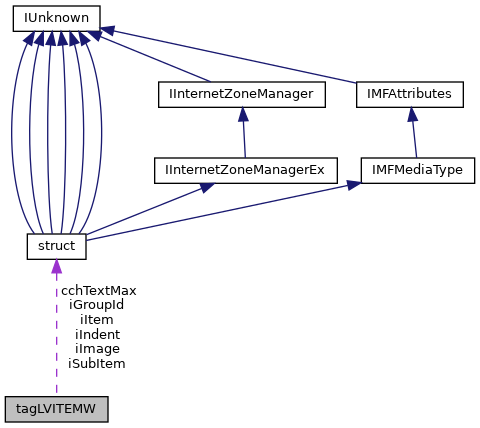 Referenced by add_zone_to_listview(), customdraw_fill(), debuglvitem_t(), FileTypesDlg_DoList(), CNetConnectionPropertyUi::InitializeLANPropertiesUIDlg(), InitializeRecycleBinDlg(), LISTVIEW_DeselectAllSkipItems(), LISTVIEW_DrawItem(), LISTVIEW_GetItemBox(), LISTVIEW_GetItemMetrics(), LISTVIEW_GetItemRect(), LISTVIEW_GetItemState(), LISTVIEW_GetItemT(), LISTVIEW_HitTest(), LISTVIEW_KeySelection(), LISTVIEW_MouseMove(), LISTVIEW_SetItemFocus(), LISTVIEW_SetItemState(), LISTVIEW_SetSelection(), CDefView::OnNotify(), RefreshDevicesList(), CDefView::SelectItem(), set_main_item(), CNetConnectionPropertyUi::ShowNetworkComponentProperties(), and toggle_checkbox_state(). Definition at line 2336 of file commctrl.h. Referenced by add_zone_to_listview(), debuglvitem_t(), FileTypesDlg_DoList(), GetDefaultItem(), GetSelectedItem(), CNetConnectionPropertyUi::InitializeLANPropertiesUIDlg(), InitializeRecycleBinDlg(), LISTVIEW_DeselectAllSkipItems(), LISTVIEW_DrawItem(), LISTVIEW_EditLabelT(), LISTVIEW_EndEditLabelT(), LISTVIEW_GetItemBox(), LISTVIEW_GetItemMetrics(), LISTVIEW_GetItemRect(), LISTVIEW_GetItemState(), LISTVIEW_GetItemT(), LISTVIEW_HitTest(), LISTVIEW_KeySelection(), LISTVIEW_MouseMove(), LISTVIEW_SetItemFocus(), LISTVIEW_SetItemState(), LISTVIEW_SetSelection(), CDefView::LV_AddItem(), RefreshDevicesList(), CDefView::SelectItem(), set_main_item(), CNetConnectionPropertyUi::ShowNetworkComponentProperties(), and toggle_checkbox_state().